A base processor that exposes Flux API for Processor. Implementors include UnicastProcessor, EmitterProcessor, ReplayProcessor, WorkQueueProcessor and TopicProcessor. 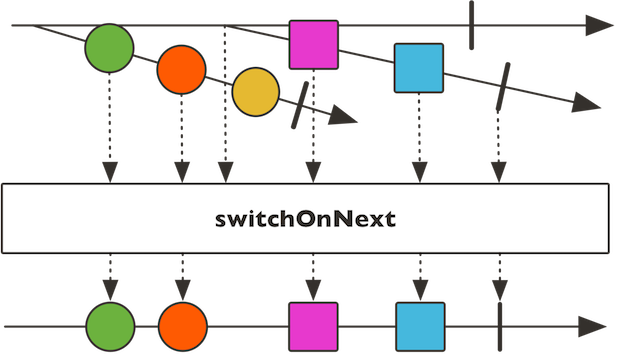 Create a FluxProcessor that safely gates multi-threaded producer Subscriber.onNext(Object). Create a FluxSink that safely gates multi-threaded producer Subscriber.onNext(Object). Build a FluxProcessor whose data are emitted by the most recent emitted Publisher. Transform a receiving Subscriber and a producing Publisher in a logical FluxProcessor. Build a FluxProcessor whose data are emitted by the most recent emitted Publisher. The Flux will complete once both the publishers source and the last switched to Publisher have completed. Transform a receiving Subscriber and a producing Publisher in a logical FluxProcessor. The link between the passed upstream and returned downstream will not be created automatically, e.g. not subscribed together. A Processor might choose to have orthogonal sequence input and output. Create a FluxSink that safely gates multi-threaded producer Subscriber.onNext(Object). This processor will be subscribed to that FluxSink, and any previous subscribers will be unsubscribed. Returns serialization strategy. If true, sink() will always be serialized. Otherwise sink is serialized only if FluxSink.onRequest(java.util.function.LongConsumer) is invoked.